As veterans of the recent Iraq War begin the push for a memorial to their sacrifices, veterans from the 1991 Persian Gulf War are reminding Americans that 25 years later, they still don't have one. Officials from the National Desert Storm War Memorial on Thursday accepted a $100,000 donation from the Veterans of Foreign Wars as the first part of a pledged $500,000 for the project. The post-Veterans Day event was designed not only to give the effort a financial boost but also to highlight the ongoing campaign, whose leaders hope to select a site for the memorial by early 2016 and raise $25 million in public donations over the next year. "We need to remember those who served and sacrificed then," said Scott Stump, president and CEO of the memorial foundation. 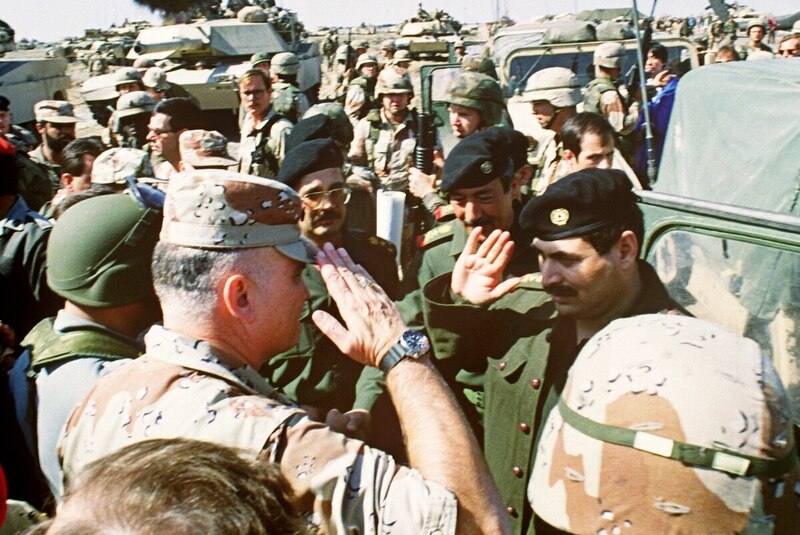 Stump said the short duration of active combat during the 1991 conflict — Operation Desert Storm lasted less than two months — has left an impression on too many Americans that troops faced little danger or opposition during the wider campaign. In total, 146 U.S. service members were killed in the fighting, and 467 others injured. "People forget that we liberated a country. Sometimes we take that for granted," said Stump, a Marine Corps veteran from the conflict. "We altered the course of history. That needs to be commemorated." VFW National Commander John Biedrzycki Jr. said the effort to recognize that work gets more difficult as time passes. "This is still early in (the memorial process), but we're not early on this idea," he said. "The recognition of service of troops from that era, those combat veterans and what they accomplished, those were tremendous accomplishments." A memorial design has already been approved, and Stump says he hopes the project gets more public attention when a final site is selected in coming weeks. "Once you have the real estate, everything just feels more real," he said.